A Pulitzer prize-winning journalist, a leader of the school reform movement, and a well-known scientist and educator will receive honorary degrees this spring during the University at Albany’s 154th commencement exercises. One of the highlights of the undergraduate commencement — scheduled for Sunday, May 17, at 10 a.m. in Albany’s Pepsi Arena — will be the presentation of honorary Doctor of Humane Letters degrees to Roger Wilkins and Deborah Willen Meier. Physicist Donald N. Langenberg will receive an honorary Doctor of Science at the University’s graduate commencement ceremony, which will be held at the Recreation and Convocation Center (RACC) at 2:30 p.m. on May 17. Langenberg will also serve as the featured speaker for the event. Wilkins, a noted journalist and lawyer, is now the Clarence J. Robinson Professor of History and American Culture at George Mason University in Fairfax, Va. A graduate of the University of Michigan, he practiced international law in New York City for four years before becoming a special assistant in the U.S. State Department’s Agency for International Development. 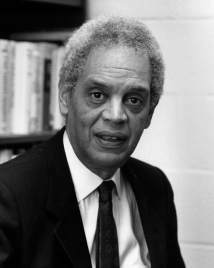 After serving with the departments of Commerce and Justice and as an assistant attorney general during the civil rights movement of the 1960s, Wilkins left government service to join the Ford Foundation. In 1972, he launched another distinguished career at the Washington Post, penning a series of editorials on Watergate. For their work, Wilkins, Post reporters Robert Woodward and Carl Bernstein, and cartoonist Herblock shared a Pulitzer Prize for journalism. In the years since, Wilkins has served as editorial board member and columnist for the New York Times, associate editor of the Washington Star, and network radio commentator for CBS News and the Mutual Broadcasting System. He published A Life: An Autobiography, a frank examination of his careers and of race relations, economic opportunity, and personal growth; and co-edited, with former Senator Fred Harris, Quiet Riots: Race and Poverty in the United States. Meier, who will also receive a Doctor of Humane Letters degree, ranks among the most acclaimed leaders of the school reform movement in the U.S. In 1974, on New York City’s East 103 Street, she founded Central Park Elementary School (CPE), a highly successful alternative school emphasizing active learning. Within the next dozen years, Meier opened two other Central Park elementary schools and, in collaboration with the National Coalition of Essential Schools, the Central Park East Secondary School. More than 90 percent of the graduates in Central Park East Secondary’s first two classes (1991 and 1992) went on to college. A New York City native and an alumna of both Antioch College and the University of Chicago, Meier is a founding member of the National Board for Professional Teaching Standards and the North Dakota Study Group on Evaluation. Currently, she serves as president of the Center for Collaborative Education, a network of nearly 40 elementary, middle, and high schools working for school reform in New York City. Meier received the MacArthur Foundation’s "genius award" in 1987. Her most recent book, published in 1995, is The Power of Their Ideas. Langenberg, the Doctor of Science recipient at the University’s graduate ceremony, is chancellor of the University of Maryland system and an expert in the field of superconductivity. At both Maryland and the University of Illinois at Chicago, where he formerly served as chancellor, he emphasized the importance of technology in enhancing the learning environment. In 1960, after earning degrees in physics at Iowa State, the University of California, Los Angeles, and the University of California, Berkeley, and spending a postdoctoral year at Oxford, Langenberg joined the University of Pennsylvania faculty. At Penn, he directed the Laboratory for Research on the Structure of Matter and served as vice provost for graduate studies and research. Former President Jimmy Carter appointed Langenberg deputy director of the National Science Foundation in 1980. 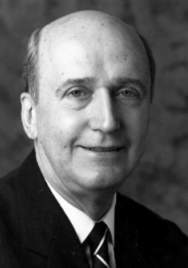 In 1983, Langenberg became chancellor and professor of physics at the University of Illinois at Chicago, assuming the University of Maryland chancellorship seven years later. The graduate ceremony will confer 728 master’s degrees and 131 doctoral degrees. The undergraduate commencement will offer several exciting innovations, including a real-time video that will broadcast the entire program on two large screens, and a slide show featuring photos of seniors, and class representatives. In all, 1,778 bachelor’s degree recipients will be honored. Volunteers are still needed for both commencement ceremonies. For information on volunteering, contact the Office of Community Relations at 442-5310. The Student Association will present "An Evening with Dr. Maya Angelou" on Tuesday, April 21, at 7 p.m. in the Recreation and Convocation Center (RACC). Tickets can be purchased at Copies Plus or through Ticketmaster. Tickets for University students are $10; non-students are $15; reserved floor seating tickets are $20. The evening begins with a performance by the University’s Angelic Voices of Praise Gospel Choir, after which Angelou will speak about her extraordinary life and read from her numerous works. Angelou is a poet, dancer, educator, historian, best-selling author, actress, playwright, civil rights activist, producer and director, who has been hailed as one of the great voices of contemporary literature. She captivates audiences through the vigor and sheer beauty of her words and lyrics. 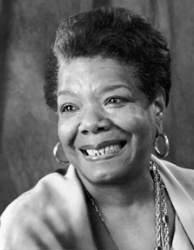 Angelou has published several volumes of poetry including Gather Together in My Name (1974), Wouldn’t Take Nothing for My Journey Now (1993), Phenomenal Woman: Four Poems for Women (1995) All God’s Children Need Traveling Shoes (1986), and The Complete Collected Poems of Maya Angelou(1994). She has also written several books for children including My Painted House, My Friendly Chicken and Me (1994); Life Doesn’t Frighten Me (1993), and Kofi and His Magic (1996). In addition, she has written six plays and two screenplays. She is now the Lifetime Reynolds Professor of American Studies at Wake Forest University in North Carolina. Born in St. Louis, Angelou spent her early childhood in Stamps, Arkansas before her family moved to San Francisco. Determined to build a stage career, she studied drama and dance. In 1952, her career took a significant turn when she received a scholarship to study dance with Pearl Primus in New York. She then joined the 22-country tour of Porgy and Bess. She married a South African freedom fighter and moved to Ghana, where she worked as an editor at The African Review. In the 1960s, at the request of the Rev. Dr. Martin Luther King Jr., she became the northern coordinator for the Southern Christian Leadership Conference. In the film industry, she has worked on numerous musical scores, both her own and of others and most recently played a role in the Universal Pictures film How to Make an American Quilt. On television, she has made hundreds of appearances on network talk shows. Angelou also has appeared on such programs as Sesame Street and Touched by an Angel. Her renowned autobiographical account of her youth, I Know Why the Caged Bird Sings, was a special for CBS in 1979. She received an Emmy nomination for her supporting role as Kunta Kinte’s grandmother in the 1977 production of "Roots" and was given the coveted Golden Eagle Award for her PBS special "Afro-American in the Arts." In 1992, Angelou was invited to compose and recite a poem titled "On the Pulse of Morning" to celebrate President Bill Clinton’s Inauguration. In 1994, she won the Grammy Award for best spoken word album for On the Pulse of Morning. Passionate and exuberant, Angelou is an ambassador to people worldwide, sharing lessons on the human spirit, and what each of us can dream about, strive toward, fail at, endure and still survive. Members of the University community will have the opportunity to take a break from their desks, computers and telephones on April 16 and 17 when the campus holds its second annual spring clean-up. Those who are interested can take up rakes, shovels and trash bags on the downtown campus on Thursday, April 16 and the uptown campus on Friday, April 17. The rain dates are April 24 and 25, respectively. No time will be charged to personal accruals, but volunteers do need the approval of their supervisors. To participate, call Melissa Kosa of the Human Resources Office at 442-3141 or e-mail her at mak82@poppa.fab.albany.edu. 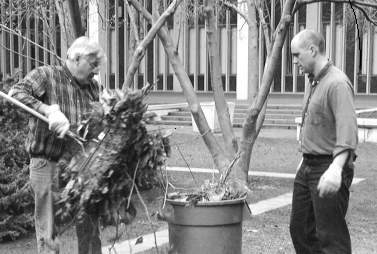 Associate VPs in the Trees: Student Affairs' Hank Kirchner and Advancement's Paul Stec (now interim VP) handle some wayward branches one year ago. President Hitchcock, in announcing the clean-up, noted that over 100 members of the faculty and staff joined the University’s grounds crew last April 25 in Albany’s first-ever spring cleanup day on the uptown campus. That event was followed by a similar effort in the fall. This spring’s campus cleanup will involve both the Uptown and Downtown Campuses. "Our physical plant staff, and the Grounds Department, in particular, annually face an almost impossible task in preparing the campus for Commencement week each year," President Hitchcock said. "Please join me in taking a few hours outside, lending a hand to our physical plant colleagues, and most importantly, making a real difference in the appearance of the campus." Kosa said volunteers will receive their assignments from the Grounds Department, which is now compiling a task list. She said workers will focus their efforts on the downtown campus and Alumni Quadrangle on April 16 and then move to the uptown campus April 17. Morning activities (9-11:30 a.m.) will include raking, sweeping, weeding and general picking up, while afternoon duties (1-3:30 p.m.) will consist of mulching, removing debris and digging for planters. Volunteers should bring gloves if they have them and wear work clothes. Rakes, shovels and other tools will be supplied.